Announcement #26: MORTIFERUM (us) for the first time ever in Europe! Like flies on a festering corpse, we once again cover the line-up for KTDF 2018 with another young US death metal band and this time we’re dripping in excitement to announce the crawling heavy death metal band MORTIFERUM for the first time ever in Europe! Hailing from Olympia WA, Mortiferum was formed by Max Bowman (guitars, vocals), Chase Slaker (guitars), and Alex Mody (drums, vocals). Their various bands (Bone Sickness, Ēōs) had played shows together regularly in the local scene as the members shared a mutual interest in Finnish and American death metal, and had a similar vision for the music they wanted to play. In 2016, after several failed attempts to get a band going, the members got together and wrote the songs that became the first demo “Altar of Decay”. They enlisted the help of Dan Fried (Triumvir Foul, Anhedonist) to fill in on bass, and recorded “Altar of Decay” in Mody’s garage. Tracking guitars and drums live in their own space, with part-time keyboard player Ethan Camp as the engineer, Mortiferum were able to capture the songs in their most visceral form. The demo was released by the band themselves and furthermore assisted by an LP release from Profound Lore Records and on cassette by Graceless Records in the US and Extremely Rotten Productions in Europe. During the band’s short existence, Mortiferum have already had the privilege of playing with such luminaries as Asphyx, Phrenelith, Blood Incantation, Qrixkuor, Triumvir Foul, and many more. The band have recently announced the addition of full-time bassist, Tony Wolfe and are currently on an 18 date West Coast tour with the also KTDF relevant band Fetid from Seattle. Mortiferum is currently writing their debut full-length to be released on Profound Lore in the impending future. Our next announcement will leave you in total darkness and despair, serving as the only Italian band on the festival, we are disgustingly delighted to present to you for the first time in the Nordic lands the cavernous horde of MEFITIC! The birth of Mefitic dates back to 2004. During nearly ten years of activity, Mefitic have released a collection of demos and splits, lurking in the underground with a few carefully curated live appearances. Nearly six years after the release of their last demo “Signing the Servants of God”, Mefitic emerged from light into utter darkness with the album “Woes of Mortal Devotion”, released under the banner of Nuclear War Now! Productions in 2015. The band has since played few but carefully selected shows, each time succeeding in creating a suffocating atmosphere. The sonic dimension of Mefitic combines different aspects of death metal that successfully infuse black and doom elements into their own personal anguishing sound. Presenting sharp dissonant, and at times hypnotic riffs that align expertly with a pulsating thundering bass and death rattling vocals – all bringing an aura of despondency and a eternity of raw violent darkness to the stage. We’re happy to offer the highest amount of Danish bands ever to play at KTDF in 2018! 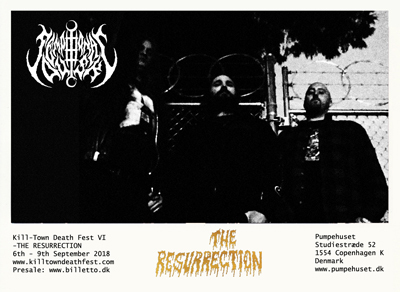 We have yet another proof of something wicked going on in the Danish underground for you and this time we’re bringing forth the Mid-Zealand based death metal trio DEIQUISITOR! Deiquisitor was formed in 2013 by Henrik B.C. and Thomas F.J. They have both played in a several extreme metal bands for more than 20 years such as Fallen Angel, Dominus, Legion, Blodfest, Sadomator and many more and with Deiquisitor they have sought back to their roots in death metal musically through the last few years. Their take on death metal is fast-paced and aggressive, very influenced by the sound and style of the early 90’s bands. The lyrical themes are about topics such as occult science, ancient mysteries and apocalyptic theories. The band started as a duo, but was joined by an ally through many years; Daniel A., on bass in 2014 and they could then start playing live shows too. They have since then released their self-titled debut album in 2015 through fellow Danish death merchants Ancient Darkness Productions and Night Shroud Records and an EP through Me Saco Un Ojo Records in 2016. 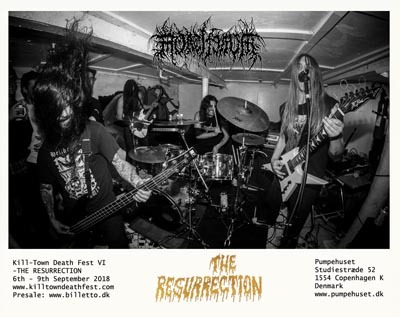 They’ve done a few shorter trips out in Europe with Kill-Towns Undergang plus a couple of Danish shows with Finnish Galvanizer and have last year finished the recording of their follow-up album “Downfall of the Apostates”, which will see its release in the late winter/early spring of 2018 through Dark Descent Records and Night Shroud Records. 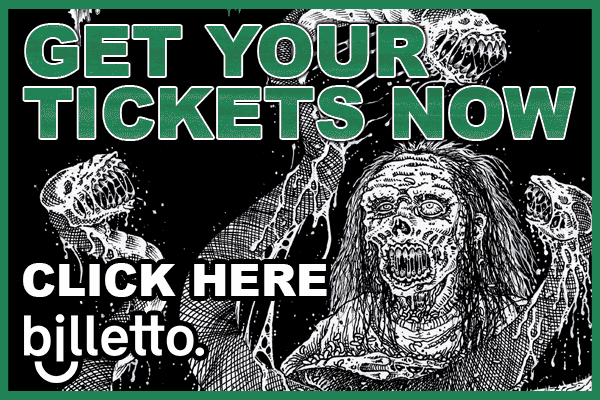 Announcement # 23: first european show ever of FETID (us)!! 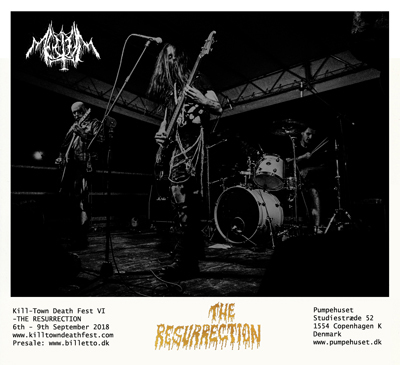 Yet again a return to the promised focus on the current US underground scene and this time we travel to the infamous city of Seattle, Washington, who in recent years have regurgitated many young promising death metal acts and this is amongst our favorites of recent years; we are excited to present to you for the first time ever in Europe, the reeking fresh corpse of FETID! 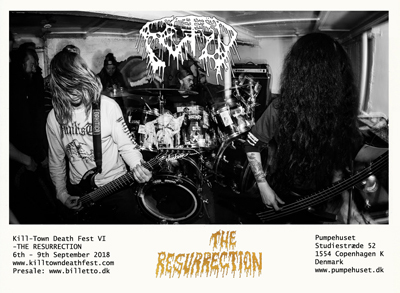 Fetid came to being in 2016 with the name change from the dissolved cadaver of Of Corpse, a band two thirds of the members played in from 2013 leading up to the formation of Fetid. In a lot of ways Of Corpse was the beginning of what we hear in Fetid today. Where Of Corpse were heavier (or should we say faster) on the grind side of extreme metal, Fetid delves deeper into absolute gut-wrenching and bowel-extracting death metal heaviness. The duo was joined by Chelsea on bass, who also plays in Seattle death grind band Cauterized, after the name change and started playing local shows and arranged to record a demo. In 2017 the band released their debut demo suitably entitled “Sentient Pile of Amorphous Rot”, though Headsplit Records and later in the year Extremely Rotten Productions, a showcase of the bands undeniably disgusting and brutally heavy grinding death metal with ultra low tuning and vile deep growls. Rumor has it that Fetid are scheduled to record and release an LP for US Northwest extreme music label 20 Buck Spin this year. The “Sentient Pile of Amorphous Rot” demo was received extremely well across both the US and Europe and we behind KTDF are repulsively excited about presenting them for the first time in The Old World in September 2018, when Fetid spills their grotesque audio infection in Pumpehuset!